A Course in Miracles distinguishes two worlds: God and the ego, knowledge and perception, truth and illusion. Strictly speaking, every aspect of the post-separation world of perception reflects the ego. However, the Course further subdivides the world of perception into wrong- and right-mindedness. Within this framework the Course almost always uses the word "ego" to denote wrong-mindedness, while right-mindedness is the domain of the Holy Spirit, Who teaches forgiveness as the correction for the ego. Thus, we can speak of three thought systems: One-mindedness, which belongs to knowledge, and wrong- and right-mindedness which reflect the world of perception. Our discussion will follow this tripartite view of mind. A Course in Miracles, therefore, is written on two levels, reflecting two basic divisions. 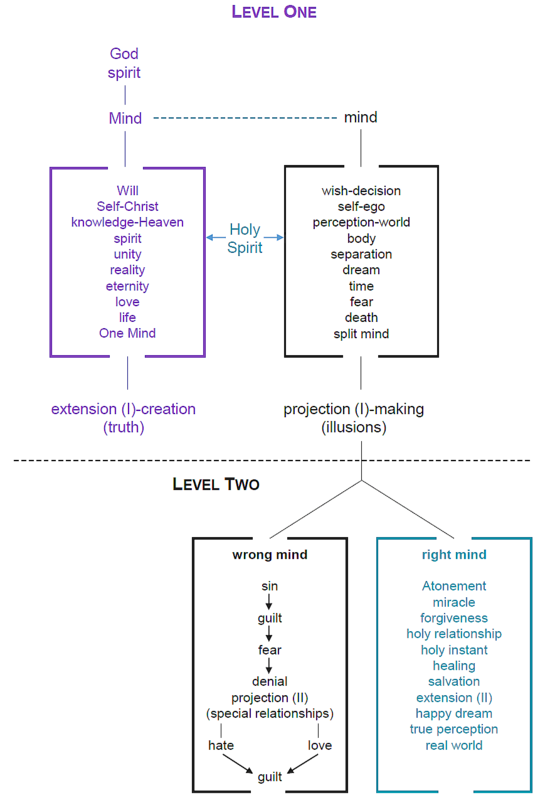 The first level presents the difference between the One Mind and the separated mind, while the second contrasts wrong- and right-mindedness within the separated mind. On this first level, for example, the world and body are illusions made by the ego, and thus symbolize the separation. The second level relates to this world where we believe we are. Here, the world and the body are neutral and can serve one of two purposes. To the wrong-minded ego they are instruments to reinforce separation; to the right mind they are the Holy Spirit's teaching devices through which we learn His lessons of forgiveness. On this level, illusions refer to the misperceptions of the ego; e.g., seeing attack instead of a call for love, sin instead of error. Thus, the Course focuses on our thoughts, not their external manifestations which are really projections of these thoughts. As it says: "This is a course in cause and not effect" (T-21.VII.7:8). We are urged not to seek to change the world (effect), but to change our mind (cause) about the world (T-21.In.1:7). When lesson 193 states: "I will forgive, and this will disappear" (W-pI.193.13:3), what is meant is that our perception of the problem and any pain that comes to us from this perception disappear, not necessarily the physical expression of the problem. For example, if rain threatens proposed plans and brings upset or disappointment, we should not pray for sunshine, but rather for help in looking at the inclement weather as an opportunity we have chosen to learn a lesson in forgiveness the Holy Spirit can teach us. This is not to deny that the ego can make or affect a physical world. However, as this physical world is inherently illusory, a result of our thoughts, the Course's emphasis is on correcting these mistaken or miscreative thoughts, which are always the true source of any problem. This correction then allows the Holy Spirit's Love to direct our behavior in the world. The One-mindedness of Christ is the world of Heaven or knowledge: the pre-separation world of spirit, love, truth, eternity, infinity, and reality, where the oneness of God's creation-the sum of all His Thoughts-is unbroken. It is the natural state of direct communication with God and His creation that existed before the mind of God's Son thought of separation. In this state the perfect unity of the Trinity is maintained. The Trinity consists of: 1) God, the Father; 2) His Son, Christ, our true Self; and 3) the Holy Spirit, the Voice for God. Included in the Second Person of the Trinity are our creations, the extensions of our Self or spirit. The Second Person of the Trinity is not exclusively identified with Jesus, who is part of Christ, as we all are. The ego consists of three fundamental concepts: sin: the belief that we have separated ourselves from God; guilt: the experience of having sinned, of having done something wrong which emanates from our belief that we have attacked God by usurping His role as First Cause, making ourselves our own first cause; and fear: the emotion that inevitably follows guilt, coming from our belief in sin and based on our thought that we deserve to be punished by the ego's made-up god of vengeance. To ensure its survival, the ego continually attracts guilt to itself, since guilt proves sin's reality and it is sin that gave the ego birth. Once it has established guilt as real the ego teaches us never to approach or even look at it, for it says we would either be destroyed by an angry, vengeful god-a god that the ego made, in fact, to suit its purpose-intent on punishing us for our sin against him, or else annihilated in the oblivion of our own nothingness. This fear keeps the guilt and sin intact, for without seeing them as decisions of our minds we can never change our belief in them. Left with the anxiety and terror brought on by the fear of God, our only recourse is to turn to the ego for help, since God has become our enemy. The ego's plan of salvation from guilt has two parts: the first is denial, wherein we push our guilt out of awareness, hoping that by not seeing the problem it will not be there. Second, after the guilt is denied, we project it out from us onto another, magically hoping to be free from the guilt by unconsciously placing it outside ourselves. Projection has two principal forms: special hate and special love relationships. In special hate relationships our self-hatred or guilt is transferred onto others, making them responsible for the misery we feel. Our anger or attack attempts to justify the projection, reinforcing others' guilt for the sins we projected from ourselves. Special love relationships have the same goal of projecting guilt, though the form differs greatly. Our guilt teaches we are empty, unfulfilled, incomplete, and needful, all aspects of the scarcity principle. Believing this lack can never be corrected, we seek outside ourselves for those people who can complete us. Special love, thus, takes this form: I have certain special needs that God cannot meet, but you, a special person with special attributes, can meet them for me. When you do, I shall love you. If you do not, my love will turn to hate. The ego's world becomes divided into enemies (special hate) or savior-idols (special love), and the true Identity of Christ in others is obscured. Judgment, always based on the past rather than acceptance in the present, is the ego's guiding principle. Through special relationships the ego sustains its existence by maintaining guilt, since using others to meet our needs constitutes an attack, and attack in any form reinforces guilt. This sets into motion the guilt-attack cycle, wherein the greater our guilt, the greater the need to project it by attacking others through special relationships, which merely adds to the guilt, increasing the need to project it. The ego's wrong-mindedness is a dream of separation, most clearly expressed in the physical world which was made as "an attack on God" (W-pII.3.2:1). The body's existence is one of sickness, suffering, and death, which witness to the seeming reality of the body as opposed to spirit, which can never suffer pain, or die. Crucifixion is the Course's symbol of the ego, representing the belief in attack and sacrifice, where one's gain depends on another's loss. All aspects of the separated world are illusions, since what is of God can never be separate from Him, and therefore what seems separate from God cannot be real. This is expressed by the Course principle "ideas leave not their source": we are an Idea (or Thought) in the Mind of God that has never left its Source. God's Answer to the separation is the Holy Spirit, and His plan to undo the ego is called the Atonement. A Course in Miracles employs many terms that reflect the Holy Spirit's plan, and each is a virtual synonym for the other. They include: miracle, forgiveness, salvation, healing, real world, true perception, vision, face of Christ, reason, justice, holy instant, holy relationship, function, happy dream, Second Coming, Word of God, Last (Final) Judgment, resurrection, redemption, correction, awakening, and undoing. These terms, belonging to the separated world of perception, refer to the process (the miracle) that corrects our misperceptions, shifting from hearing the ego's voice of sin, guilt, and fear, to the Holy Spirit's Voice of forgiveness. In this way, special or unholy relationships become holy. Without these relationships we would have no way of being freed from the guilt the ego has taught us to bury through denial, and retain through projection. The Holy Spirit turns the tables on the ego by changing its purpose for projection into an opportunity to see this denied guilt in another, thereby bringing it back within which allows us finally to change our minds about it. While the practice of forgiveness, or undoing guilt, is usually experienced as complex and long term, it can be understood essentially as a three-step process (see, e.g., T-5.VII.6; W-pI.23.5; W-pI.70.1-4; W-pI.196.7-11). The first step reverses the projection as we realize that the guilt is not in another but in ourselves. Second, now that the guilt has been brought to our attention and we recognize that its source is in us, we undo this decision by choosing to see ourselves as guiltless Sons of God, rather than guilty sons of the ego. These two steps are our responsibility; the final one is the Holy Spirit's, Who is able to take the guilt from us now that we have released it to Him, looking at it with His Love beside us, and thus without judgment and guilt. This looking without judgment, in gentle laughter, is the meaning of forgiveness. Using the workbook as our guide, we become trained over time to hear the Holy Spirit's Voice, learning that all things are opportunities to learn forgiveness (W-pI.193). Illustrative of this process-aspect of forgiveness are the references under periods of unsettling and bringing darkness (illusions) to the light (truth), as well as workbook lesson 284. These reflect the almost inevitable difficulty that results when one begins to take the Holy Spirit's lessons seriously, and allows the deeply denied guilt to begin to surface in one's consciousness. When our guilt is finally undone, right-mindedness having corrected wrong-mindedness, the bridge to the real world is complete. The memory of God dawns within our minds, as all interferences to it have been removed and we see the face of Christ in all people. This world of illusion and separation ends as God takes the last step, reaching down and lifting us unto Himself. Restored to the One-mindedness of Christ, "we are home, where ... [God] would have us be" (T-31.VIII.12:8). Several words, especially those pertaining to One-mindedness, have no precise meaning in this world and their definition can only be approximated here. As A Course in Miracles says: "words are but symbols of symbols. They are thus twice removed from reality" (M-21.1:9-10). It should be noted that many of the terms have different meanings or connotations outside the Course, and these should not be confused with the Course's usage. Moreover, some words have differing uses in A Course in Miracles itself, reflecting knowledge or perception (e.g., extension), right- or wrong-mindedness (e.g., denial). Some terms, incidentally, appear in more than one listing. The capitalization used in the Course is followed here. Thus, the Persons of the Trinity-God, Christ (Son of God), Holy Spirit-are always capitalized, as are all pronouns referring to Them. Pronouns referring to the Son of God in his separated state are lower case. Words that directly relate to the Trinity, such as Love, Will, Heaven, etc., are capitalized, though their pronouns are not. "ideas not leave there source"
"I am as God created me"
"ideas not leave their source"